Dark, evil and deliciously demonic, Incantation’s debut was the sound of descending into the wretched bowels of hell made flesh; unrelenting, extreme and as disturbing as a pit full of contorted, flesh-stripped bodies. Just a cursory glance at the song titles unveils the bands intentions: “Blasphemous Cremation”, “Rotting Spiritual Embodiment,” “Christening the Afterbirth”. Revelling in sludgy, misanthropic malice, Onward To Golgotha is a masterpiece of doomy, dirge-ridden disease and should go down in history as one of the dirtiest sounding death metal records to be released. If Incantation’s modus operandi was to disturb and disgust then they should consider themselves 100% effective. In the annals of death metal few can live up to this sick blast of grandiose extremity and in a genre where it can be notoriously difficult to stand out from the pack, Incantation’s diabolical debut elevated them to the upper echelons of the scene. 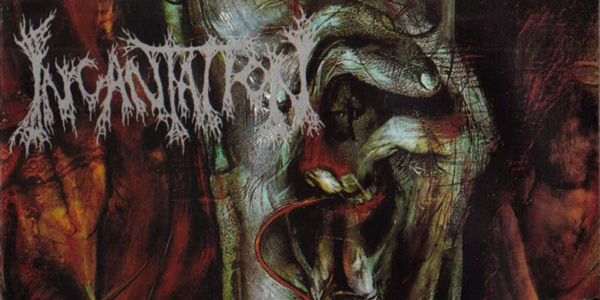 Which death metal albums can you not live without? Pop ’em in the comments below….. Gruesome Honour The Death Metal Gods With New EP! The old-school death metal machine moves up a gear! Dive in to Ursinne's death metal cess pool!